The "Scrape Drill" is use to teach LB's the proper inside-out relationship needed to leverage ball carriers in the 40 defense. 1. Place 2 cones approximately 20 yards apart. 2. Align one of the 2 cones slightly inside the other. 3. LB's will align on the outside cone and the RB's will align on the inside cone facing each other. 4. 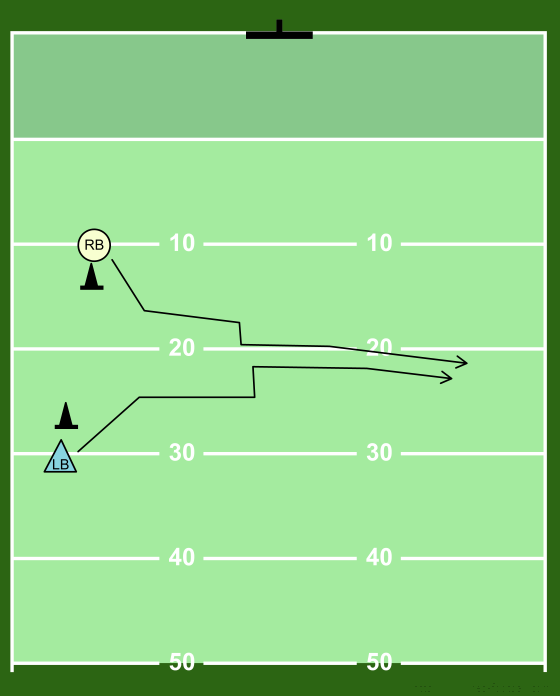 On the coaches whistle the RB will either run on an angle or turn his shoulders and run parallel to the LOS. 5. The LB will gain ground while remaining on the ball carrier's inside shoulder should the RB run on an angle. 6. The LB will shuffle keeping his shoulder square if the RB turns and runs parallel to the LOS. 7. The drill ends with a form tackle. 8. Perform the drill to both sides.